...it's ok to post a snow themed card on the second day of Spring! 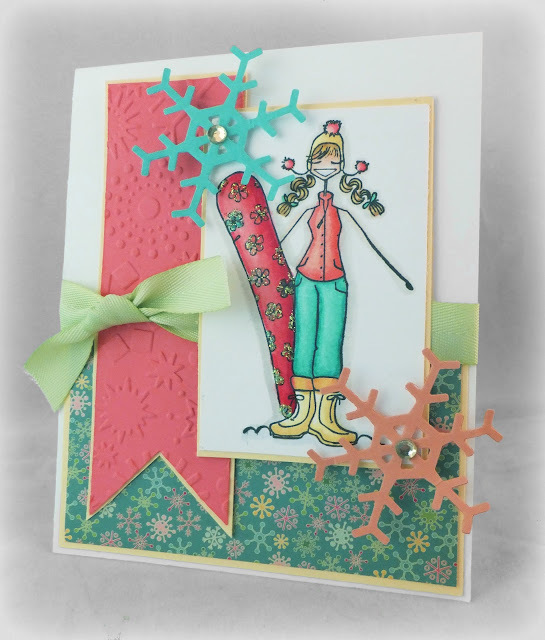 :) I made this card Sunday night while the snow was lightly falling and I really love how it turned out! 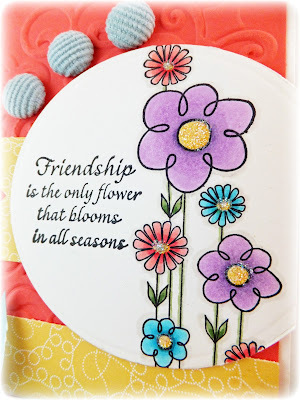 I pulled out my "daisyboardabella" stamp from Stamping Bella for the very first time! I know, crazy! She was another stamp that I had somehow managed to forget about and once I found her, she was calling my name! 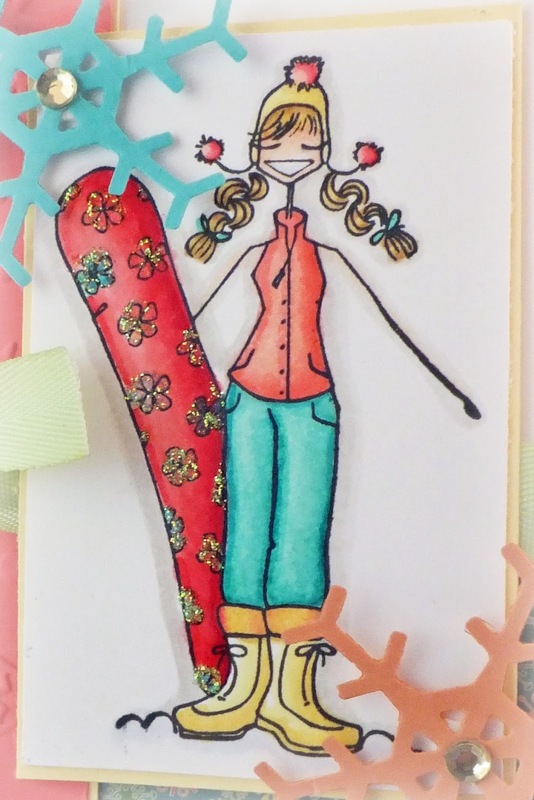 So to make this card I used Jen's Sketch For You To Try. It was another sketch that had jumped out at me so I am glad I got to use it! I colored Bella with my Copics and added some glitter to her board. The paper is from an older Cosmo Cricket Christmas pack but I thought it fit the theme of this card perfectly! I then used my Snowflakes embossing folder on my strip and cut out some snowflakes using my Snowflake sizzlits. That's it for today's post! Enjoy your Wednesday everyone! Happy Spring! Is everyone else extremely glad to see Spring arrive? Even though I live in the mountains and see snow on the ground when I look outside my window, I'm still relieved to know that we are almost done with the cold weather! For some reason, this winter seemed to drag on forever. I was a little worried we would never make it to March 20th! Anyway, I'm back to share this pretty card with you. I made it for a dear friend of mine who has been a huge blessing in my life lately. I had completely forgotten that I owned these stamp sets until digging through my supplies the other day and I am SO glad I found them! Both sets are from Rubbernecker and I had picked them up at a local craft a few years ago. The sentiment is from the set called Floral Silhouettes and the flower image is from the set called Wild Flower. Isn't it a gorgeous stamp? To make my card I used this past week's Taylored Expressions Sketch Challenge. I fell in love with this sketch the minute I saw it and so I was excited to get to play! I also stumbled across the Splitcoast challenge from yesterday which was to use only part of an image on your card. Since my stamp was so big, this challenge was perfect for my card! I colored my flowers with Copics and added glitter to the flower centers. 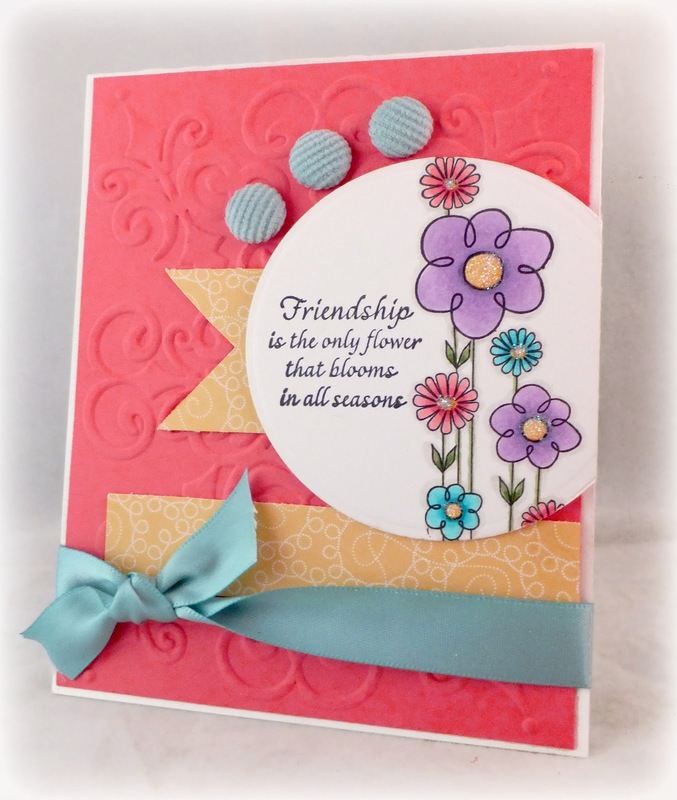 The background was embossed using the Sizzix Damask #3 folder. The dp is some old Stampin' Up! paper I had in my stash and the buttons are old Stampin' Up! Baja Breeze corduroy buttons. Here is a detailed shot of the flowers. Thanks for stopping by today! I hope some of you are blessed with warmer weather than we are today. It is currently only 30 degrees here and it's almost 2:00! Yuck!